Keman is an interior ornament to be hung in temples. It symbolizes a garland of flowers, which used to be given to noble people in India. Many of the keman have garland designs for this reason. The thirteen keman-ornaments introduced in this article had been kept in Tō-ji temple in Kyoto. each of them is made of cow-hide onto which images were painted. 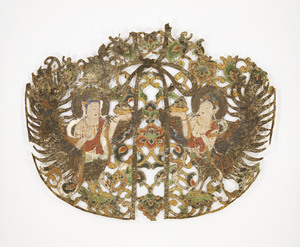 The design of one of the keman consists of a pair of sacred birds, Karyōbinga (Kalavinka), and its background is decorated with hōsōge flowers. Another keman is decorated only with hōsōge flowers. In both of the designs lines flow pleasantly. The coloring method shows the same characteristics as the method used for Buddhist painting in the late Heian period. The keman with the design of Karyōbinga is decorated not only with colors but also with gold, which makes it even more gorgeous. According to the record of Buddhist services held in the pagoda of Tō-ji temple, a "keman-dai" was used during the Buddhist services held for celebrating the foundation of the five-storied pagoda in 1086. The Documents on Newly-made Buddhist Implements of Tō-ji temple contains a record which says that eleven keman were made in 1101. The extant keman-ornaments can be classified into several groups with respect to the composition of designs and manufacturing techniques. Some of them may be the very items recorded in the above-mentioned documents. Masterpieces of Nara National Museum. Nara National Museum, 1993, pp.114-115, no.89. Copyright© Nara National Museum All Right Reserved. Any and all photographic images and text of this website are proprietary to the Nara National Museum.